Hester Thrale inherited the Welsh Bach y graig estate of the Salusbury family after the death of her mother in 1773. It comprised a wood, a farm or two, a dilapidated Church and a few cottages. Bach y graig House was the earliest brick house in Wales. Built in 1567 by Sir Richard Clough1, second husband of Katherine Tudor of Berain. Richard made a pilgrimage to the Jerusalem, became a Knight of the Holy Sepulchre2 and returned to Great Britain where he accumulated a considerable fortune and was knighted, becoming Sir Richard Clough. his own and his wife's initials; and beneath, 'Cor unum, via una;' the arms of Elystan Glodrudd; and those of Sir Thomas Gresham, and of several kingdoms with which these munificent merchants traded. There are, besides, some broken wheels, with a sword, the usual emblems of St. Catherine. When Hester and Henry Thrale visited in July 1774 accompanied by Samuel Johnson, it had been dilapidated and unoccupied. The floorboards were stolen, the windows broken and boarded-up. The picture of The children of Israel bitten by serpents still present. at a monstrous expense  because his little wife was vain of it. The main house was demolished in 1817 but its other buildings still stand as a farm and guest house3. There is a nature trail through 40 acres of ancient woodland which hosts several ancient species of plants. It is said that his Satanic Majesty was the not architect of Bach-Y Graig, but merely the contractor, who supplied the bricks and other materials; the clay for the former having been, as is supposed, dug from the bottomless pit, and baked in his own kiln, in the nether regions; the ambitious builder consenting to consign his soul to him, as payment, in case any human eye should see them when in conference together at midnight, in the room alluded to, which had no window. It is also said that Satan only supplied at once the daily quota, and that when the workmen had used up all the materials each evening, they always found a fresh supply in the morning. But, at last, the builder' lady, wondering that her lord should always retire to this dark room at midnight, with that curiosity which is natural, if not peculiar to ladies, one night peeped slyly through the key-hole, and having caught a glimpse of Satan's person and hideous physiognomy, set up a scream, in her fright; and at that instant, the devil snatched away her lord through the wall, carrying a large portion of the brickwork along with him, in his hurry to secure his prey. 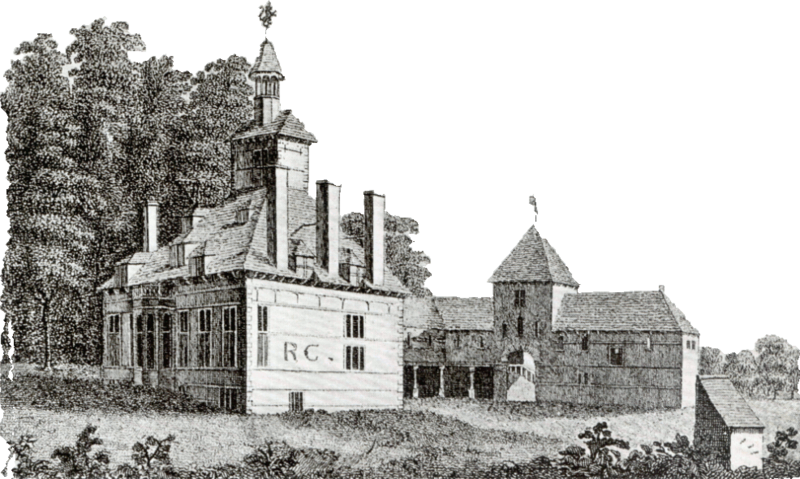 To account for this legend, it is said that Sir Richard was a great astronomer, that he had an observatory at the top of the house, where he used to spend nights together taking observations of the heavens; and while he was thus engaged, and, perhaps, "devoutly looking up from nature to nature's God" the ignorant peasantry thought he was seeking divination, and holding conference with evil spirits. 2. Richard Clough, http://en.wikipedia.org/w/index.php?title=Richard_Clough&oldid=309744186 (last visited Apr. 2, 2010). The new site design is very good, extremely professional, well done. Well I have now stayed at Bach y Graig! On my birthday my girlfriend arranged for a nights stay as a treat. Brings it all into perspective. We only live 9 miles away in Rhuddlan at weekends so not far but still a world apart. We had a great hike to the top of Tremerchian and across the front of the Brynbella estate which is a public footpath. Took a couple of photos of the front (unfortunately with me in them). Bach y Graig was fantastic, if there are two level floorboards in the place I'd be amazed! the RC over the arch is still very clear as it is at Plas Clough. So now I've almost done the Thrale Welsh tour Bach y Graig, Brynbella! Hello - I am finding this history all very interesting to read. My husband is actually a direct descendant of Richard the Hen and Sir Richard. We are planning a trip over to the Uk to stay at Bach y Graig. Is there any video from the BBC on Sir Richard? We would like to link to your page of information about Bach-y-graig, and in exchange, would ask if it were possible for you to give us a link on your site. Dear Mr Thrale, Wonderful site but I have to question the quote above from your Bach-y-craig page. No crusades at that time I am afraid! I found your site by entering Brynbella in a web search because the present owners have just visited Samuel Johnson's Birthplace Museum in Lichfield. Where I work. David Well-spotted. I blithely took this information from elsewhere without realising the discrepancy. I have now corrected the article. Thank you.